For me, the Evan Williams brand has always conjured a negative connotation, likely because it was the rail whiskey poured by inexperienced bartenders at all of my sleazy undergraduate watering holes. But now that the days of plastic cups, flat mixer sodas, and sticky bar floors are (mostly) behind me, I’ve set out to reacquaint myself with the distiller. Named for the Bluegrass State’s first distiller, Evan Williams is the number two seller of Kentucky straight bourbon whiskey in the U.S. (the first being Jim Beam). It is distilled and bottled at the Old Evan Williams Distillery in Bardstown, Kentucky, where Parker and Craig Beam oversee production. Corn, rye, and barley from local farmers are the main ingredients, as is a strain of yeast that has been in the Beam family for eight generations. Like the name suggests, each bottle from the Single Barrel line originates from one specially selected barrel, which is why the bottles vary in color and flavor both within and between years. The whole idea is to create a “unique taste experience.” In line with that goal, each bottle comes complete with two born-on dates: one for the day it was placed in a charred white oak barrel to age, and one for the day it was bottled. The bottle sampled for this tasting was barreled on November 9, 1998, and bottled on June 12, 2008. This practice of creating a new vintage every year has helped Evan Williams accumulate plenty of accolades, including “Whiskey of the Year” (The Spirit Journal, 1990) and “Spirit of the Year” (Food & Wine, 1992). This is, without a doubt, no rail spirit, and that becomes clear as the bourbon takes on a golden amber hue in the glass. With a slightly milky consistency—especially on the rocks—it presents a clean nose of butter, lemon, banana, and hay. The taste of melon, honey, and sugar is highlighted by a calming butterscotch finish. A spicy tingle creeps up at the very end, almost as if to remind you to take another sip. While the flavor is big enough to stand up to most cigars, I think medium-bodied smokes pair best. Spice is a bonus, helping to offset some of the bourbon’s sweetness. Excellent compliments include the H. Upmann Signature, Cuban Crafters Cubano Claro, La Aurora Barrel Aged, and the Hoyo Epicure Especial. 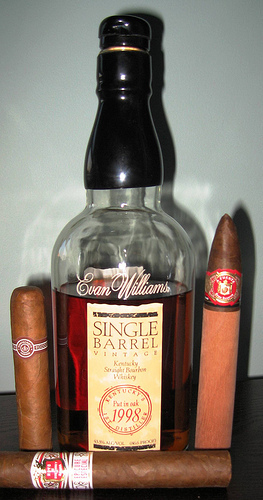 Whatever you smoke, though, I think you’ll agree that the Evan Williams Single Barrel Vintage 1998 is an outstanding sipping bourbon—a far cry from any rail spirit. And with a price tag in the range of $25-35 per 750 ml. bottle, you needn’t fear buyer’s remorse. Don't know if this is still the case, but I remember finding the EW 96 and 97 for sale for $21 in Virginia state liquor stores. Can't beat that price! This is my favorite everyday sipping bourbon. There is a store that sells it for $25/fifth near my office that, needless to say, I frequent quite often. This is a surprisingly good drink. I picked one up at Christmas for about $20, and I am just now pairing it with cigars. While it is not quite as good as my regular drinking bourbons (Makers Mark and Woodford Reserve), it is a nice alternative for a reasonable price.